OCMC Missionary, Jennifer Rice, just completed one-year of service. Please keep her in your prayers that she may be given continued strength in sharing the Orthodox Faith in Guatemala. On April 6th, Jennifer Rice celebrated her first year in the mission field of Aguacate, Guatemala. What made it even more special for her? The fact that the date was Holy Friday, which, she says, “helps me put into perspective what mission is all about as I consider the mission of Christ Himself”. Over the last year, Jennifer has been a part of many wonderful projects to share her faith with our brothers and sisters in Christ in the Church of Guatemala. Mentoring the Aguacate choir, who lead the faithful in congregational singing of the services, has been among her favorite activities. 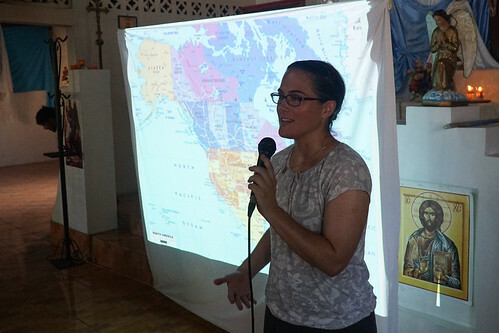 She has been dedicated to archiving the courses offered by the Seminary of St. Andrew in Aguacate and took part in many parish visits throughout Guatemala for various youth retreats, liturgies, mass chrismations, baptisms, and weddings. Another task she held was assisting in hosting and translating for four visiting OCMC mission teams. In 2018, there are three medical teams scheduled to serve at the Fr. Andres Giron Medical Clinic in Aguacate. There are also two teaching teams making preparations to visit Guatemala during this summer.